Jadine Hobden, 18, turned up drunk at The Windmill Inn in Burgess Hill in November last year and attacked a man who worked there, breaking his skin with her teeth, a court heard. Hobden, of Brougham Road in Worthing, pleaded guilty to assault by beating (two counts), assaulting an emergency worker and theft from a shop and appeared at Worthing Magistrates’ Court yesterday for sentencing. Already serving a prison sentence for a different offence, Hobden was produced from custody and sat in the dock flanked by two security guards. The series of incidents on November 20 last year began when Hobden approached a girl and asked for a cigarette. Still fearful of her, the girl told the court in a statement: “She grabbed hold of a chain that my friend was wearing. Since the attack she has been afraid of being attacked again by Hobden. Prosecutor Gaynor Byng told the court that after this attack Hobden made her way to the Cooperative supermarket in Maple Drive, where she stole Cheesestrings and sandwiches. She continued: “She then attended The Windmill Inn. “She was refused entry due to the fact that she was deemed to be heavily under the influence of alcohol. Police were called and Hobden was found vomiting nearby, the court heard. “She then assaulted the officer who was in attendance by kicking him in the leg,” the prosecutor said. 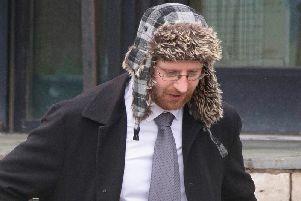 Defence solicitor Matthew Baines said that Hobden is a young girl who has suffered with mental health issues since the death of her boyfriend. He asked that she be given credit for her guilty plea and that any sentence not affect her existing prison release date. Chairman of the bench Jackie Casey sentenced Hobden to six weeks in prison for the offences, to be added on to the end of her existing jail sentence. She was also ordered to pay £50 in compensation to each of the three assault victims.